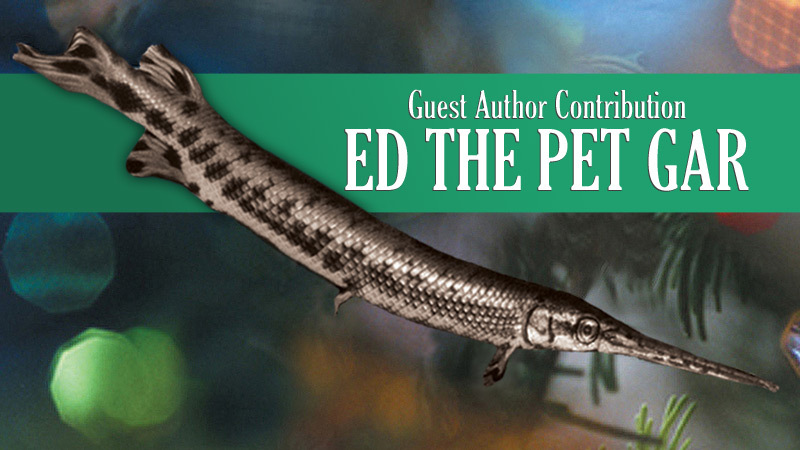 “Ed the Pet Gar” was authored by a guest contributor. If you have a story or pictures you’d like to share, feel free to reach out to us at blog@americanexpedition.us. Thank you, Dana M., for introducing us to Ed! I have a very old long nose pet gar, and I just looked at your website about gars–it’s very good! I liked learning more about gars, especially that they can lay so many eggs every year. And…..I just thought I’d tell you about my “pet” gar. He is a long nose gar. I bought him in an Austin, Texas, fish store 37 years ago!!! He has lived with me in Texas first, then we moved to California and took him with us, and now he’s back in Austin. He’s on his third aquarium now. He has grown to about 2 feet. I hope he doesn’t get much bigger! I know how big they get in the wild. A few years ago a fish friend of his died–it wasn’t a gar. It was a tropical fish. When it died, I saw Ed carefully taking him to the surface on TOP of his long mouth. I guess he thought the fish needed air like gars do. He didn’t, because he was a regular tropical fish you get at the pet store. Whenever a fish dies, Ed won’t eat for several days. Anyway, I liked your website with gar information and wanted to let you know about my gar.